So many reasons to celebrate: birthdays, anniversaries or vow renewal, all things wedding (engagement, ceremony, blessings, pre and post wedding celebrations, mini-moons), graduations, christenings or just because it is Friday! So many ways to celebrate other than a party. Here are just a few examples of events we have been delighted to help organise but please contact us to discuss your own special day. Alex and Kate asked for a simple, intimate ceremony in a private location. 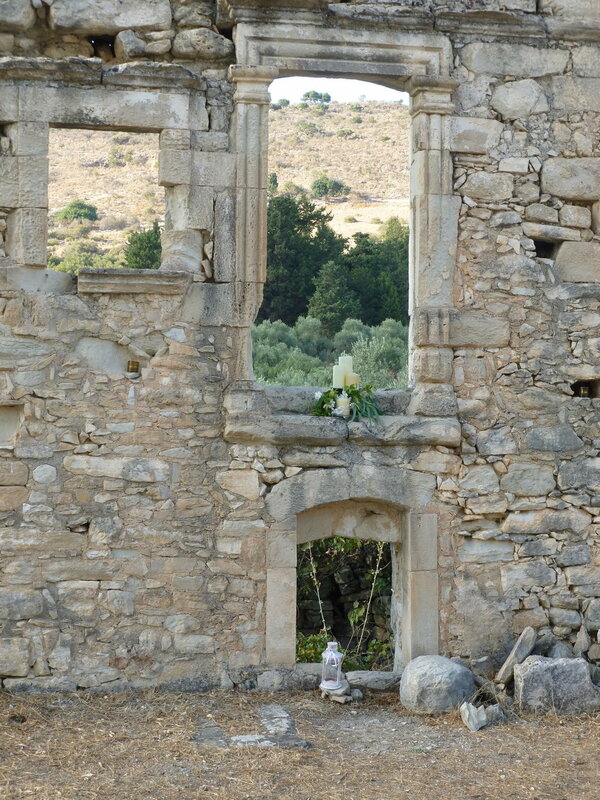 We found this hidden church overlooking a lush valley, candles and tea lights hanging in the trees added a magical element as dusk fell, and the couple danced to the sound of a solo violinist after they made their vows before the mayor. They ended the night with a private meal in a local taverna. This beautiful beach wedding was the perfect blend of two strong cultures and families. 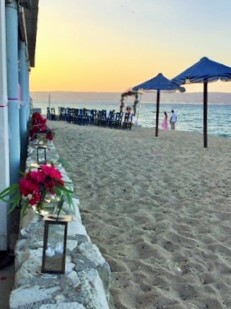 With feet in the sand, the personalized service was conducted by a family friend. Simple local bouganvillea matched the brides stunning outfit, a shocking contrast with the blue backdrop of the sea and sky. live 5 piece dance band. This couple wanted to keep things simple for friends and family. An elegant, beautiful fuss free wedding all in one venue: The Roof Terrace was set up for the traditional style blessing. During the cocktail hour and photos it was transformed for the formal reception meal, and then again subtly altered with the use of lights for the party. A lavender sunset, thousands of fairy lights, tears of laughter and joy. Stunning. This artistic couple wanted to spoil their guests to a week of treats. After a series of welcome dinners, string quartet cocktail party, sight-seeing excursions then bachelor/bachelorette nights, they took over a village complex with guests staying on site for a festival style wedding. A fusion Greek/English blessing in the on-site amphitheater, banquet style Greek feast, singers, chill out area, dessert and cocktail bar, photo booth, Greek dancers, DJ party until the early hours– this was an affair to remember! A second wedding, a smaller, intimate celebration on a private estate, surrounded by lush orange groves, rivers and framed by the White Mountains. The blessing took place on site in the Estate chapel, followed by a silver served catered meal, serenaded by a singer and guitarist followed by a night of dancing under the stars. Truly a Big Fat Greek Wedding! Held from start to finish within this totally unique stone ‘Koumos’ venue, the blessing took place in the museum, cocktails with Greek musicians at the bar, dinner in the ancient threshing circle, party on the open dance floor, photobooth and chill out area in the Koumos, greek dancers, plate smashing, fireworks, money dance – we had it all!! Christy & John wanted family and friends to enjoy a fun, memorable day. It started with a scenic mountain journey by private electric train to a hilltop church for the ceremony. 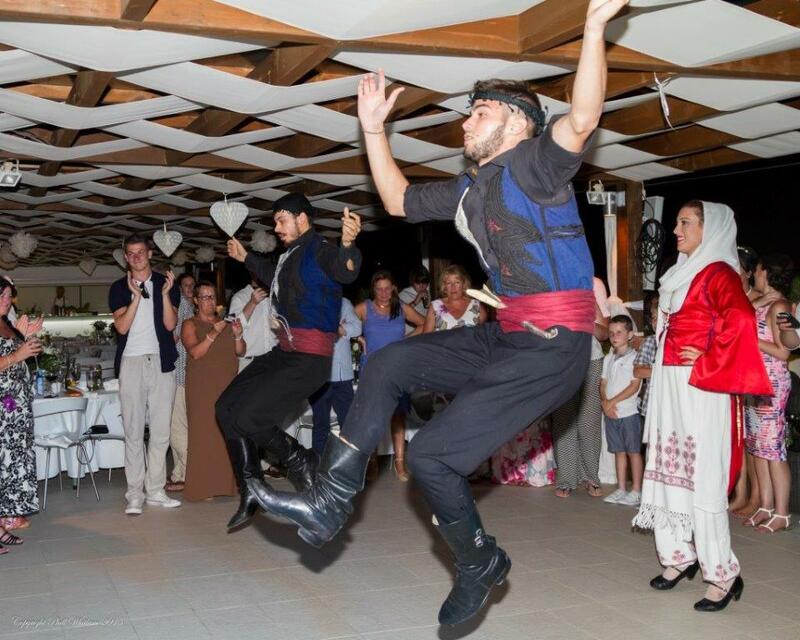 After photos including gyrocoptor footage, Pimms and homemade lemonade the guests returned to a lavish Greek buffet followed by dancing under the stars to a DJ! It started with a treasure hunt! Organised as a surprise by the couples daughter, we arranged a trail of clues leading Klaus & Gisela to cafes, shops and tavernas in the village (they were given treats along the way) until they reached the beach. The last clue - on a hill top you will hear an angel singing – led them to a guitarist and singer performing ‘Hallelujah’, with friends and family gathered to watch them renew their vows, before a sunset champagne toast and then a meal in a local taverna. 6 couples celebrated their anniversaries in June and decided to celebrate in style on a private yacht! With a private transfer to Chania Harbour they were welcomed on board with cocktails & canapes, before an exhilarating ride out of the harbour. Anchoring in the calm bay of the island (a nature reserve with wild Kri Kri, the national animal of Greece) a sumptuous dinner was served with time for snorkelling, before chasing the sunset around the island and spotting seals. As the sky turned purple and the lights in the harbour came on, the friends enjoyed this unique perspective with mellow music, coffee and chocolates. Finally, with a prosecco toast to the sun, they sailed past the lighthouse back into the harbour for their transfer home.